Petrofac chief executive Ayman Asfari told Sky News that since the Deepwater Horizon incident, the oil and gas industry has been working to improve safety, despite the prospect of diminishing returns as oil and gas becomes harder and more expensive to extract. You can view the Sky News interview here. Whilst it is hard to verify such claims (it has only been a manner of months since the incident), Deepwater Horizon has of course shone the spotlight on the oil and gas sector harder than ever, but also reminded companies of the potential consequences (most notably financial, costing BP billions of dollars, but also loss of life, environmental and reputational too) that incidents can have. As already discussed in a previous article on this blog there are some initial indications that poor process safety culture had a leading role in the blast that killed 11 people earlier this year, although investigations are still ongoing. However, will the findings of these investigations hold any surprises? Most safety specialists can probably already guess the findings, so there are no reasons why organisations cannot begin improving safety already, as Mr. Asfari indicates they are doing. The big question is: will this renewed interest in safety make the difference needed? The list so often quoted (usually followed by ‘never again’) gets ever bigger – Longford, Texas City, Piper Alpha, Deepwater Horizon – and it is unlikely ever to stop growing completely (although we’d hope that the size and frequency of incidents reduces over time). Will we see another event on the scale of Deepwater Horizon, or has it finally sunk in that ‘safety pays’? The Institute of Ergonomics and Human Factors (IEHF) will be holding their annual Human Factors in the Oil, Gas and Chemical Industries conference in Manchester this year. This is a two-day conference, and will feature Professor Andrew Hopkins speaking on both days. The IEHF is offering a reduced ‘early bird’ price if you book your place by 31 August 2010. You can book your place or find out more about this event by visiting http://www.ogc2010.org/. Other speakers will include Judith Hackett (HSE); Cheryl Mackenzie (US Chemical Safety Board); Ron McLeod (Shell International); Helen Rycraft (Magnox North Sites, also a member of the EI’s Human and Organisational Factors Working Group); Peter Jeffries (ConocoPhillips, also Vice-Chairman of the EI’s Human and Organisational Factors Working Group); Caroline Sudgen (Health and Safety Laboratory); Dave Nicholls (Step Change in Safety); Simon Robinson (BP); Jim Weatherbee (BP); Martin Anderson (HSE); Zoila Harvey (Wood Group); and George Petrie (Petrofac Offshore). In addition, the Energy Institute will be holding a Hearts and Minds half-day workshop on the 24 November as part of the conference (see http://www.eimicrosites.org/heartsandminds/training.php for more information). The site provides information on how to prevent injuries, as well as a blog detailing the local initiatives that are taking place, with two recent initiatives focusing on preventing cycling injuries through the wearing of helmets, and preventing drowning during the summer months. It’s a sad truth that we assume bad things only happen to other people, of course until they happen to us (by which time it is too late). 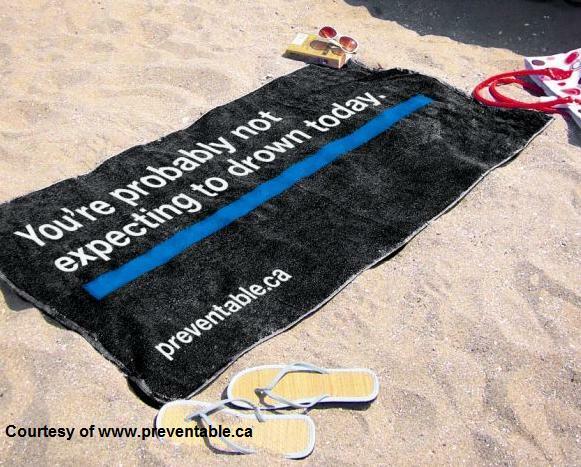 To encourage people to change this way of thinking, CAPI have various campaigns that use slogans such as “You’re probably not expecting to drown today” printed on beach towels and placed on beaches around British Columbia, or “You’re probably not expecting to need a helmet today” printed on cycle helmets. It is hoped that these campaigns will make people stop and realise the absurdity of the statement – since you can never know that you will be injured in the future, the only way to prevent that injury is to expect it and take steps to mitigate the risks, such as wearing a helmet or life jacket. Is this methodology practical in the workplace as well? Certainly from an occupational safety point of view, this can be applied to the use of ladders (“you’re not expecting to need someone to hold this ladder today”), fire doors (“You’re not expecting to need to escape a fire today”), stairs, etc., but can it also be applied to maintainance or control rooms, etc.? It would be interesting to hear from companies that have implemented anything like this in their workplace. See www.preventable.ca for more information. You are currently browsing the EI HOF Blog blog archives for August, 2010.